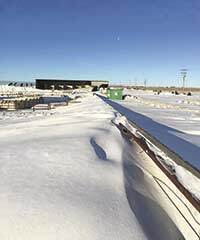 Several feet of snow sits in the feed alley at Dutch Road Dairy, near Muleshoe, Texas. The winter storm Goliath hit on Dec. 26 and 27. 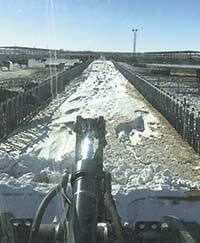 Snow drifts filled the cattle pens (left) and buried calf hutches (right) at Dutch Road Dairy, a neighboring dairy of Joe Osterkamp, near Muleshoe, Texas. MULESHOE, Texas - Dairy farmers in Texas and New Mexico are expected to lose nearly 35,000 cows after winter storm Goliath ripped through the region on Dec. 26 and 27. "It snows occasionally and gets cold down here, but it's never done anything like this before," said dairy farmer, Joe Osterkamp. "It was a freak disaster." Almost two feet of snow fell with 60 to 80 mile per hour (mph) winds during the two-day storm. Osterkamp lost 195 cows on his 3,000-cow dairy. He, his father, Jerry, his brother, Nick, his wife, Camille, and their children, Wylie, 6, Lyla, 5, Etta, 2, and Clara, 4 months, farm together near Muleshoe, Texas. "It's a sad situation," Osterkamp said. The beef industry is also expected to lose nearly 4,000 feedlot and 3,000 stocker-grazing cattle, according to Darren Turley, executive director of the Texas Association for Dairymen. Because of the typical desert-like climate, Osterkamp and other farmers in the region keep cattle in dry lot open facilities. "That's pretty standard here. Our facilities are designed for the climate," he said. "That's why we don't have any barns." Prior to the storm, farmers received warnings about the approaching inclement weather. "They said this could be a bad one," Osterkamp said. Knowing the storm was coming, Osterkamp and dairy farmers in the region, prepared for Goliath. "They did all they could," Turley said. Osterkamp had windbreaks on the north side of the pens, stacked hay bales around the dairy to provide quick access to drop into the pens when needed, and he made sure his generator was ready. "We took the steps we normally do for a winter storm," Osterkamp said. "We thought we were ready." By Dec. 26, the storm rolled in. "The winds became stronger and it started to snow harder," Osterkamp said. "It built from there." At 8 p.m., Osterkamp received a call from an employee working the night shift in the parlor. "He told me the electricity was flickering, so I went to reset the compressors," he said. He also had two employees who lived 15 miles away call at midnight to say they were on their way to the farm. "I told them not to come," he said. "Unfortunately, they got stuck and were rescued 16 hours later by the National Guard." At 2 a.m. on Dec. 27, he received a call from an employee who was out by the maternity pen. "He told me he couldn't see anything," he said. "We went out there to get him." While they were outside, Osterkamp's brother walked the fence line. "He disappeared for 1.5 hours," Osterkamp said. "We were really worried about him." However, he was able to get back to the farm in a loader, but the 60 to 80 mph winds and snow made it difficult to maneuver back. "There was zero visibility," Osterkamp said. "He had to pull out Google Maps on his phone to direct him back to the barn from a spot on our own place. He zoomed in as far as he could on the map to find his way back." Once Nick reached the barn, Osterkamp, his brother, dad and employees were stuck. "There was literally nothing we could do," Osterkamp said. "It was unbelievable. We decided to wait it out until the sun came out." At sunrise, Osterkamp checked the cows in a pen closest to the barn. They were all up against the wind blocks. "We tried to bring them into the parlor that morning, but we couldn't get them to move at all," Osterkamp said. "It was blowing and snowing so hard that the National Guard shut down the roads. We knew it was serious. If someone fell or got hurt, it could be serious since we wouldn't be able to get medical attention. So, we called everyone in and waited until it cleared before we did any work." Finally, the snow and wind started to lift by 4 p.m. on Dec. 27. "It lightened enough, so we jumped in the loaders right away," Osterkamp said. "Our first priority was getting feed and water to the cows. We were in survival mode." However, the feed alleys were filled with five to six feet of snow and there were 20-foot drifts along the milking barn. "We started moving snow right away," Osterkamp said. "But we still couldn't get the TMR to the cows until the next day, so we dumped hay bales into the pens so the cows could at least eat something." Since they missed the morning milking due to the weather, the next priority was moving the cows into the parlor. "There was only one pen we could access to start moving cows into the parlor," Osterkamp said. By 7:30 p.m. on Dec. 27, Osterkamp and his employees were able to start milking the first group of cows. It took until 4 p.m. the next day to move the whole herd once through the parlor. "It took us the equivalent of two entire milking shifts to get that done," he said. The milk truck finally pulled into the driveway on Dec. 29. "We usually ship four loads of milk per day," Osterkamp said. "But during the storm, we only dumped one load of milk since the cows were stuck outside." Osterkamp said production has suffered. Cows were producing an average of 68 pounds per day before the storm, but the first days after, cows were producing 35 pounds per day at best. "This was a high stress event for them, plus they missed a milking," he said. "There really wasn't much to pick up when the truck came the first time." Thankfully, milk production is up to the mid 50s. "They're slowly creeping back up, but it's still disheartening to see the numbers," Osterkamp said. Despite the drop in production among dairy farms affected from the storm, Turley said there would not be a big swing in milk prices. "It may speed up the up turn a bit, but there won't be anything drastic," he said. Although the cows are coming back up, Osterkamp said he knows there are more challenges ahead. "We missed a whole week of breeding due to cleanup and sorting cattle since everyone was mixed together. Even though the cattle look good, they were stressed, so reproduction will take a hit," Osterkamp said. "It's an issue that hasn't surfaced yet along with related metabolic diseases." While Osterkamp and his family were cleaning up the snow, they counted 195 cows lost in the storm. "It was terrible," Osterkamp said. "Since the wind was blowing from the northeast, the pen of cattle on the east side of the barn was hit the hardest with death loss while the heifers in the pen furthest west had the lightest death loss. It was all dependent on how the dairies were set up." But Osterkamp said the loss would have been far worse without the help from his neighbors. "They came over with their equipment and helped us clean up," he said. "They sped clean up by days for us, and I think that saved a lot of cows. I can't speak highly enough of their kindness." With many other dairy farmers in the same boat, Turley said one of the biggest challenges has been removing the carcasses. "It's a big area with high cow loss," Turley said. "The rendering services have hit their max." Turley said farmers have buried the carcasses in the snow until the rendering trucks can get there. He's also worked with the Texas Commission of Environmental Quality to come up with other solutions. "We've had circumstances where they've allowed mass burials, and we are working with them on composting options, too," Turley said. "We've also worked out agreements with the landfills to accept carcasses there." The rendering service has already gathered the carcasses from Osterkamp's farm. "We're fortunate we called early," Osterkamp said. Turley said farmers will also see financial struggles following the storm. "We're looking for financial aid programs available for the farmers," Turley said. "But they're limited. This was a true test of the farmers' insurance. Right now, it isn't helping with costs. That leaves the FSA program aid and that's limited." With the high loss of cattle, Turley said there's potential for farmers to build barns after the storm. "Living through the storm with the loss of cattle could spark the interest," he said. Despite the challenges, Osterkamp is optimistic for the farmers in the area. "It was sad and just recently hit home for us, but the resilience in the farmers has been astounding," he said. "We suffered, but the we plan to come back and do it better. It didn't scare us off. We're in it for the long haul." Looking ahead, this storm will stick with Osterkamp for years to come. "It's a story we will tell the grandkids about," he said. "It will be a storm people will talk about for the next several generations."